This antique service station sign advertises Gulf Fuel. The sign is circle with a red border and black interior. 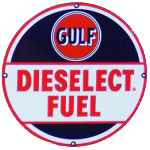 In a white banner across the center of the sign reads, “Dieselect Fuel.” The orange Gulf logo is printed at the top.